Do you have a recycling bin full of cans left over from the Holidays? KCans4LIFE Collects $.05 redemption cans and bottles in support of LIFE! 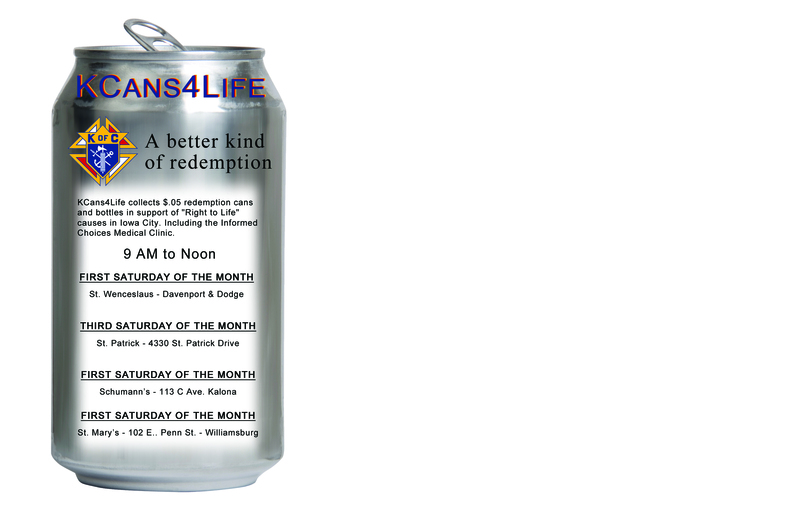 You can drop off your KCans4LIFE anytime from 9 to Noon. The First Saturday of the Month: in the parking lot of St. Wencesluas of Iowa City on the corner of Davenport & Dodge, at St.Mary’s Church in Williamsburg and at the Schumann’s 113 C Ave, Kalona. Third Saturday of the Month at St Patrick’s church in Iowa City 4330 St. Patrick Drive. As always, no need to sort, we’ll take care of everything. All proceeds go directly to Informed Choices Medical Clinic, Johnson County Right to Life, and Birthright to help women in need make the right choice: LIFE. Hope to see you all there on Saturday.